Everybody need not be an Engineer or a Doctor! The mindset that only mainstream careers mean something, is wrong. The whole month of December, I am looking at alternative careers that can be satisfying as well as rewarding. I caught up with a 21 year old student pursuing culinary arts. You might wonder what that is! I had the same thoughts, so I did a bit of research online. In really simple terms, culinary art refers to the process of cooking and arranging food. How many of you thought about ‘MasterChef‘? I know, I did! It piqued my interest, so I decided to do an interview with her. Following are the excerpts from it. 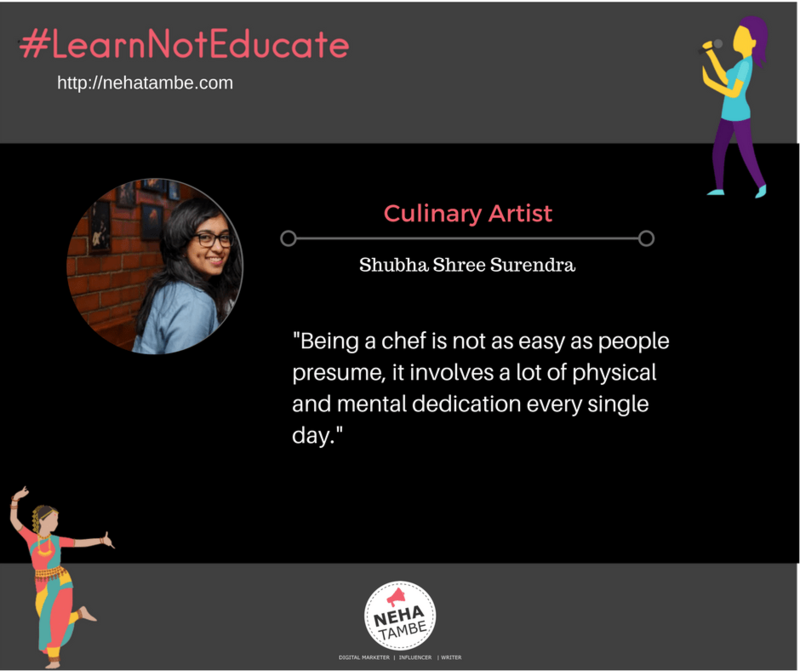 Today we interview Shubha Shree Surendra who is pursuing culinary arts at the North Shore International Academy, Auckland, NZ. What kind of background is required to apply for this course? Education wise- you could be anything above a 12th pass student. There are age groups from 17 to 50+ at this institute. but most importantly- one must have LOTS of patience, determination, physical and mental strength for this course. Are there entrance tests? when should one start preparing? Not really, most institutes do not require any prior knowledge or technical skills for this course. However, interviews and cover letters play an important role in fixing yourself a spot at any skill-based institute. Questions are usually based on how passionate you are towards the course as well as WHY you chose this field. The course that I am doing is a LEVEL 4 And 5 in culinary arts (Doing both levels is optional, but recommended if you want a decent position in the industry). this is a 2-year course, consisting of 4 terms. You will be taught A-Z of culinary foundation through the 2 years – right from holding your knife to presenting a completed dish. difference between hotel management and culinary arts? The culinary arts refer to professions that involve preparing and cooking food. Culinary artists often are compared with restaurant managers in both education and career scope. Generally, the major differentiating factor for culinary artists and hotel management students are the specific college programs, the type of training and experience involved and the actual duties associated with each job. A culinary arts program will have subjects like nutrition and sensory evaluation, American cuisine, international cuisine and meat science. Management programs, in contrast, focus on educating individuals on how to operate the restaurant from a business management perspective. At the end of 2 years, you will be a certified chef, capable of working at any restaurant/hotel- positions may vary with experience, skill, etc. Other job options could be a personal chef, food stylist, cookbook author, food scientist, and so on. some tips for students looking for a similar course? Being a chef is not as easy as people presume, it involves a lot of physical and mental dedication every single day. For a chef, the holiday season is the busiest so forget partying during New year’s or vacationing during long weekends- this is when you’d be expected to show up in the kitchen. Do not join this profession if you are not passionate/interested in cooking; a lot of people I know have ended up choosing this course because they think they have no other option or they want to give this a “try”. Take my word, you will not be happy if you cannot give this your 100%. what some people also don’t know is that cleaning and maintenance of hygiene plays a major role in the kitchen so expect to wash dishes when you enter the industry- that is how you grow and learn. The kitchen is a hot, loud, noisy, busy but extremely satisfying place with a high swear-word frequency: be mentally prepared. Can these courses be done in India? what should a student look for while choosing an institute? India has several schools/colleges that offer a course in hotel management but only a handful that offer a mainstream culinary course. Personally, I did not enjoy my experience in the culinary college I studied at, in India. Most Indian schools have a different approach with the education system, but then again- it’s just a personal opinion. There are 100’s of wonderfully talented chef’s that Indian schools have produced as well. My advice before choosing your school would be: RESEARCH. Do thorough research of the school you choose. Ask questions, do not hold back. One tip would be to ask previous alumni- the ones who are not mentioned on the college website, if you want honest answers. What is the process of applying for foreign universities and what should the student keep in mind? – know your rights, rules and regulations of the country before choosing. If you wish to work during your study period, find out visa restrictions and availability of jobs. Research everything about the country- from cost of living to future opportunities (if you wish to stay back). Most students apply for universities/ colleges through an agent- I did too. It is a much faster and easier way of application as they help make sure all criteria are met and processes complete. Most countries require test of language. Exams like IELTS/TOEFL, etc can be attempted, based on what the country accepts. I hope this was an informative interview, the way it was for me. And I sincerely hope this will help more students and parents choose from the various career avenues that are now available. This is an interesting and informative interview! Culinary arts is gaining a lot of interest thanks to the popularity of shoes like MasterChef – I’m sure this information will prove helpful to anyone who wishes to pursue this field! I never knew that culinary art is different from hotel management. Thanks for sharing this very informative post, Neha. 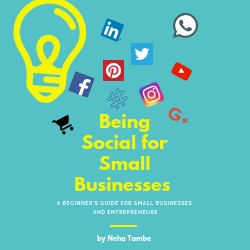 This will be really helpful for people who want to join this career. Nowadays there is lot of scope to pursue courses in various fields. There is a course based on the interests of a person. Also if one gets to learn and make their hobbies their career , nothing can be more fruitful and satisfying than that. But there is no option to hard work. One needs to work hard and show persistence to succeed. I agree to what she said..”Take my word, you will not be happy if you cannot give this your 100%.” That’s so true not just for culinary arts but for any field. You have to be passionate then only you can give your b at and gain the best out of it. Thanks Neha for introducing us to these talents people. 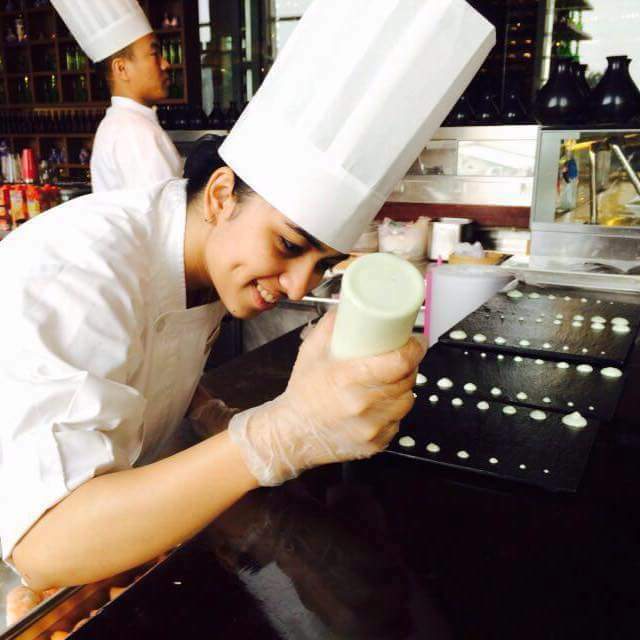 I wish Shubha all the very best in her chosen field..
You have made a perfect guidance post for those looking a career in culinary arts. Helpful post for students. Thanks Amrita! Will dig these details and update soon. Thank you Gayatri! Do share and help spread the word. Wow.. Being a food enthusiast, I so loved reading this interview. Thanks for sharing. I really wanted to tell you that I like your Blog chatter projects topic. This is something which is close to my heart and I even have a post in draft about this topic of conventional careers in India. I feel its high time we stop looking at only doctor or engineering as a good career option in our country. Good to know about Shubha and her story. Looking forward to more. This is really good post. All details in one place. I appreciate your efforts to culminate everything so beautifully. My husband is a Chef and I vouch by the physical and mental strength needed for this profession. It definitely is tough and for those who are interested, it is a challenging and satisfying profession in my opinion. This was so informative. I had no idea about this profession. so nice to see so much dedication going into ones art and passion. It is a great career option for the next generation. I am foodies and absolutely loved reading the interview. I had absolutely no idea about this profession. It is nice to know about such alternate careers. That’s a wonderful insight to this interesting , & creative field. Good to see the number of options that exist today interns of career selection. Love the interview. And love your #blogchatterproject. Hope you meet the goals that you have set out to achieve with this brilliant idea. I had always wanted to be a chef. Wish I dared to speak my mind and took that as a career. Nonetheless, this is a fantastic interview and some great tips for those who want to take up culinary as their career. Its so good to see new career avenues for the current generation. and nothing like making ones passion their means of earning a living! Being a Food Blogger myself, I can’t tell you enough about how informative & well written this post is. Being a food blogger this was a very interesting read. Awesome new courses with hotel managenent culinary studies …have come in. What an awesome prepwork of a course to get into the restsurant /hotel industry. Such a great career option. I always love to read about people who follow their passion and talents! Oh yes!!! Why just be a Doctor or engineer when you can be much more.. It is heartening to see the various options available to find a career and such articles go a long way in encouraging the younger generation. This is so interesting & informative. I have always been a foodie, but getting to know about people behind the scenes, people who make our food so awesome is a different experience.